What are the best photo editing books? Find out what our readers think are the best books on photography software like Photoshop, Lightroon, Aperture, NIK, GIMP etc. And feel free to share your favorite! What photo edting books do you love? 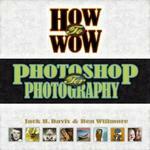 Note that there’s an updated version to this: "How to Wow: Photoshop CS3 for Photographers." An oldie, but goodie, I love this book! It’s got a lot of useful techniques to punch up your images in Photoshop. Some are subtle effects, like correcting skin blemishes, or adding a little extra sharpness. Others are more "radical" ways to change your image with artistic effects. There are also some tips on creating digital frame effects for your images, and making collages. I like the step-by-step format of the book, with illustrations at each stage of the process being described. It does help to have some prior Photoshop knowledge, as the book assumes you can navigate your way around the basic tools. I’ve had this book for a number of years, and I still go back and refer to it. Those are our readers’ picks for best books on digital photography. Next, you may want to check out top picks for landscape photography books.